This tip just totally changed the wing game. Super Bowl Sunday is right around the corner, and for millions of Americans that means one thing: It's time for some amazing party food. Of course, I like the game, and I do look forward to the funny commercials (and the halftime show! ), but what I get most excited about is the spread. 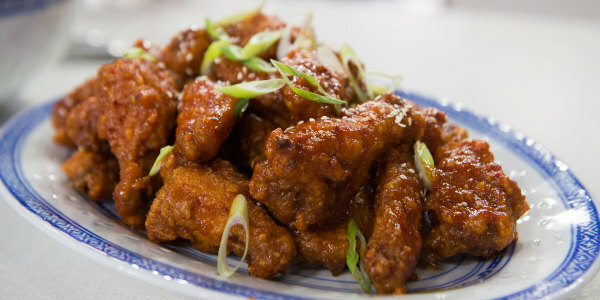 I am a sucker for dips, all types of finger foods and the ubiquitous football party staple: chicken wings. I love serving chicken wings to a hungry crowd, but I don’t like frying them up, because it's pretty cumbersome to dispose of used cooking oil ... and then there’s that fried smell that seems to linger in the kitchen, and all over the house, all day long. In the summer, I grill chicken wings, because those lovely charred bits taste delicious. But I live in New Jersey, and the last thing I want to do in the middle of winter is stand outside by my grill. So my other favorite technique for cooking wings is to use the oven. A great chicken wing has crispy skin, which is easier said than done, especially in the oven. One of the biggest mistakes people make is saucing their wings before putting them in the oven. The real key to crispy, oven-baked chicken wings is making sure the skin is totally dry, which requires a little patience. After you remove wings from the package, thoroughly pat them dry with paper towels. 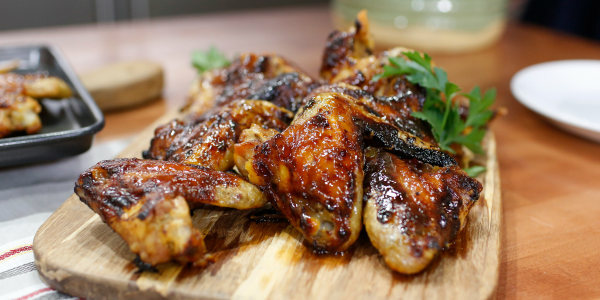 Place the wings on a cookie sheet lined with a paper towel and loosely cover the chicken with wax paper. Then leave the wings in your fridge overnight, or at least for a few hours. If you’re short on time, there's another hack for getting crispy skin. Place the paper towel-dried wings in a large bowl or plastic bag and add in a mixture of baking powder (not baking soda) and salt, then shake it up. 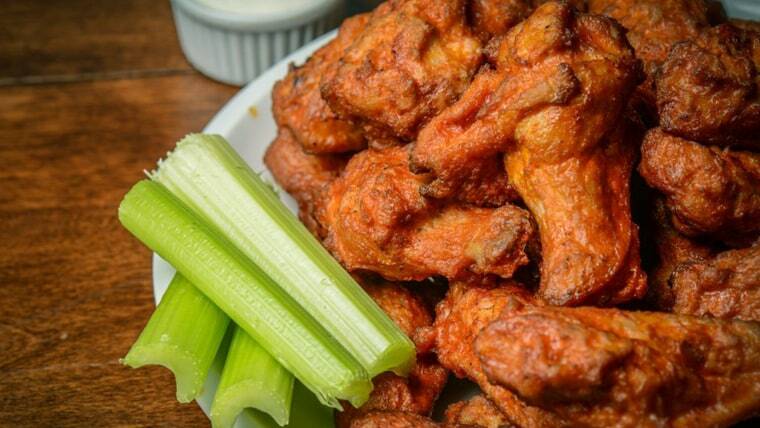 For every pound of chicken wings, use one teaspoon of baking powder and half a teaspoon of salt. When you're ready to bake, make sure the oven is hot (heat is the other trick to crispness). Preheat the oven to 425 degrees, line a rimmed baking sheet with foil and top with an oven-safe baking rack. If you don’t have a rack, spray the foil with nonstick baking spray to prevent the chicken from sticking. 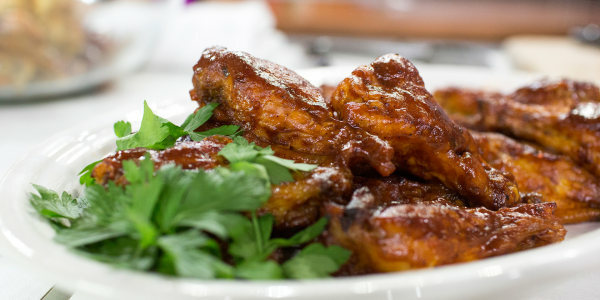 Place the chicken wings in a single layer on the rack and bake for approximately 35 minutes, flipping halfway through. They are done when the juices run clear or an inserted meat thermometer reads 165 degrees. If you're throwing a party, try going beyond Buffalo sauce to keep all mouths happy. When the wings are done, let them cool for a few minutes before saucing them. Divide the wings into separate bowls and add different sauces to each. I like to serve a few different flavor profiles: There’s always something spicy (you can't go wrong with classic Buffalo), something sweet (like a honey barbecue) and something unexpected, such as soy ginger or lemon pepper. 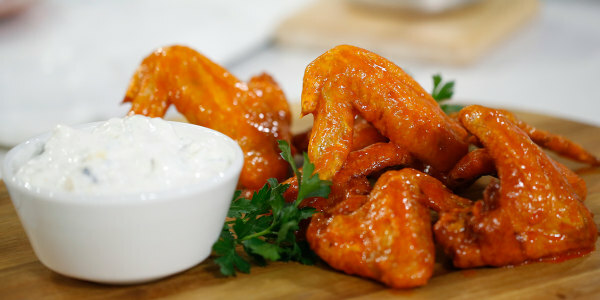 And last but not least, you've got to serve wings with blue cheese dressing (or a delicious ranch!) for dipping and a side of celery sticks.